This design for a corner module actually involved ideas from several modelers, including ideas from some people outside our club. The main line tracks are located 5" and 7" from the front edge of the layout, which fits the standard for HO scale modules. But, by making the overall width of the module 12 inches, the module can be reversed and used as either an "inside" corner or an "outside" corner, because the tracks are also 5" and 7" from the back edge of the module. This allows us to set up displays in "L" shapes or "U" shapes, rather than being limited to rectangular configurations. 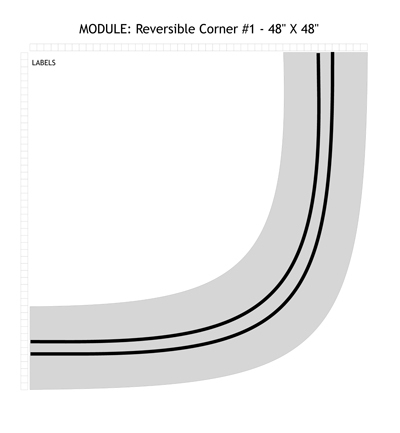 The reversible corners have an outside radius of 48 inches, which is the same as all our other corner modules, except the two oldest (and largest) ones. That discrepancy is not a problem. We just have to make sure that the two "matching" corners are at diagonally opposite corners of the display, or that we use our special World's Shortest Module to fill the gap created by having these two larger modules on the same side of the display. Our reversible corners made their debut as part of a multi-club layout. The ability to join two or more clubs� modules together is just one advantage of standardized modules. While most of the modules in our display are owned by the club members, we always need to have at least four corners to make a complete loop, so most of the corners are club-owned. Diagram showing the general arrangement of this module. These can be used as inside corners or outside corners, allowing greater flexibility in layout design. Entire site ©2008-2012 Royersford Modular Model Railroaders.